As I was reading a book written by Dr. Robert H. Schuller called "Hours of Power" , I came across a message entitled "Is it Time to Reorganize?". His message was that since we are coming to the end of another year, this would be a good time to reflect on whether or not you were successful in achieving your goals. If the answer is no, then perhaps reorganization is necessary. Even if you were successful, reorganization may still be necessary because there may still be some things in your life that need to be changed. Based on your answers to these questions, you can decide for yourself what and what not to change. 1. I am a single black female who is broke, busted, and disgusted, living paycheck to paycheck. 2. I have come from a loving family where my parents stressed the importance of getting a good college education that would lead to a rewarding career of my choice. 3. I got here ("here" meaning broke and disgusted) by being overzealous in pursuing my goal of making money online. I had the desire, but I lacked the knowledge of how to do it correctly. Eventually, I got in way over my head, as my debt continued to climb to the point where I was struggling to meet my expenses. 4. I want to be able to say goodbye to my 9 to 5 job and say hello to a new career of making money online full time, via affiliate or network marketing. I want the freedom live comfortably and do the things I've always wanted to do without worrying about the cost. 5. I can get there by reorganizing myself --by breaking old habits that hinder me and by forming new habits that will help me reach my goal. For example, I have decided that I will try paperless billing instead of receiving paper bills every month. I've set up a dedicated gmail account just for bill paying only, so my ebills will not get lost. This is a small step, but it is one that will help me move forward in being more organized. 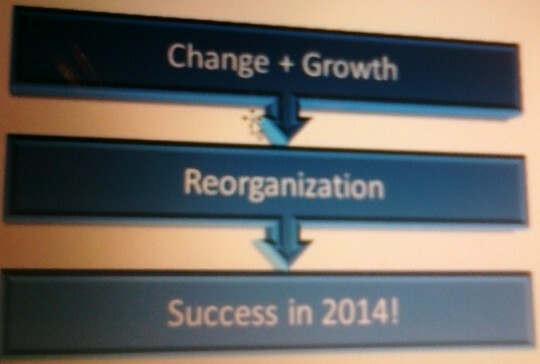 Reorganization is a necessary reaction to change. Change is necessary for growth. Without growth, life would be static and dull. People who want something better but are resistant to change, will have a hard time achieving their goals. Say goodbye to 2013 and all the failures and mistakes that you made. Say hello to 2014 and get reorganized and be prepared to meet new challenges that may come up in your journey on the road to success. It is my sincere hope that I have provoked you into thinking about what you want to achieve next year and how you want to go about it. I would also appreciate comments and discussion about how you are reorganizing yourself. Just remember, if whatever you did this year did not get you the results you wanted, make sure that you reorganize yourself and do something different. Don't be insane--doing the same things and expecting to get different results. Deidre, I really enjoyed your article. It was easy to read, understandable and useful. Thank you. Glad you enjoyed the article. Best wishes for success in WA. Hello Deidre,great blog with great advice. I joined WA in 2014 - 2015 and wasted my time procrastinating and got nowhere. I have reorganised myself this year and started well. Someone also wrote that you can't carry your past with you,otherwise you will always remain there. All the best and success here at WA and online. Thanks for the compliment regarding my blog. Like you, I have procrastinated and let life get in the way, so I have to get back on track and start working again on my blog. Best wishes for success in 2016. 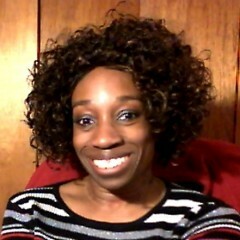 Deidre, I am a newbie that have tried so many online oppts that never panned out. I've recently joined WA praying that this really works. I'm feeling so overwhelmed with information that I don't know where to start. After reading your blogs, I'm feeling refreshed again. Thanks for your encouraging blogs. Best wishes "Ladyluck". Thanks for your kind comments. I'm glad I helped. Best of luck to you in the coming year. Deidre, I know you will make your goals a reality in your life. Thanks for the great post, I will answer the 5 questions for myself, as a reminder of my journey to success! Hello I agree and thanks for the GREAT advice. Welcome 2014…2013 and other years are gone but not forgotten, I am thankful for my failures because without them I can’t learn and get better in the future…now I have a better understanding of what not to do. That's great! How are you reorganizing yourself? Dee, you have a way with words! This is some great advice for 2014 and beyond! Receiving e-bills and receipts will certainly help with keeping track of what needs to be paid on a monthly basis, and make it easier to develop a spreadsheet for an at-a-glance viewing. My re-organizational goals for 2014 is to automate all platforms around my blog so that I don't waste too much time in front of my computer. Here's to our success in 2014 towards re-organization. Setting up a spreadsheet is a good idea Crystal. I will set one up for my e-bills. Thanks. you got real with yourself on question 1. Nice. I am trying to keep my focus sharp before the new year. Excellent post - Reorganization is a necessary reaction to change. great advise thanks for the share !!! Wow, thanks for sharing. I already made my list and now I have to take the first step of seeing it through. Thank you for sharing this and I wish you the best for 2014. God Bless! Deidre, This is an excellent post and it is definitely a great time to figure out where I am at and what I am going to do in this next year. I have been thinking about this a lot over the last week and am looking forward to reorganizing myself for the upcoming year. This info here has been very helpful in this process. What a great list and personal example!